This dazzling, unconventional biography shows us why, more than three centuries after his death, Rembrandt continues to exert such a hold on our imagination. 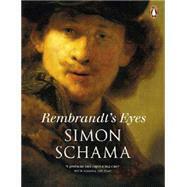 Interweaving the few known facts of the Dutch master’s life with fully illustrated explorations of his work and his age, renowned scholar Simon Schama reveals Rembrandt’s genius anew. Rembrandt’s Eyes is a commanding synthesis of scholarship and storytelling that contributes a wholly new understanding of the artist and his place in history. SIMON SCHAMA has taught history at Cambridge, Oxford, and Harvard universities, was art critic for the New Yorker, and is currently a professor of history and art history at Columbia University. He is a prizewinning author whose books include The Embarrassment of Riches, Citizens, Landscape and Memory, The Story of the Jews, and The Power of Art, which has been made into an Emmy-winning television series.